MakeMyBrowser.com is a unique and exclusive site that helps you to create your own personalized browser. It will perform just like any other browser; simple internet explorer (e), Google, or Google Chrome and Mozilla Firefox, but you can now make your own personalized browser for free. MakeMyBrowser.com has come up with the distinctive idea of having one’s own browser. 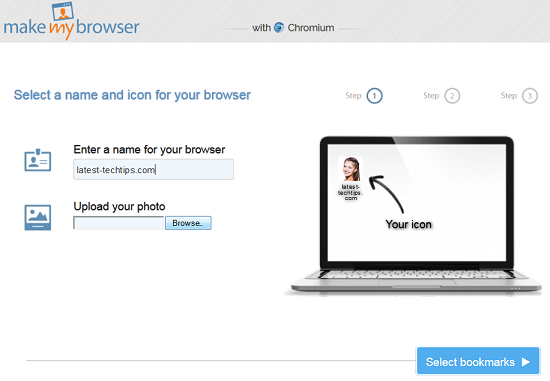 The website uses a very simple process to help you to create your own browser for your own computer with Chromium browser as its base. Moreover, having your own personalized browser has two essential benefits. Every family member uses the computer at your home, be it your mom, dad or sibling. To log in and log out from windows is still comparatively easy although it is very time-consuming and involves a lot of your effort. In addition, it is definitely not possible at all to install two Google chrome on your computer. With MakeMyBrowser, you can easily let your brother to keep on using Chrome while on the other hand you use your own personalized browser and continue to enjoy the good speed. Not only that you can create more than one browser, one for yourself and other for your sibling. The other benefit which it offers is that you can easily navigate between your two Gmail / Facebook accounts when you create your own browser. You can also use your own favorite image for your personal browser. One point that adds to the value of MakeMyBrowser is that you can easily log in and log out without having to type your password repeatedly. In addition, you can have two different browsers; “fun browser” with links to YouTube, hulu, and other sites and “work browser” with work related links and extensions respectively. Make your browsing more personal to suit your specific moods and needs!